Organic food has been noted in various studies as having similar nutritional value as commercial foods. These studies usually look at the dry ashed concentration and are designed for the food producer. In this study the average elemental concentration in organic foods on afresh weight basis was found to be about twice that of commercial foods. 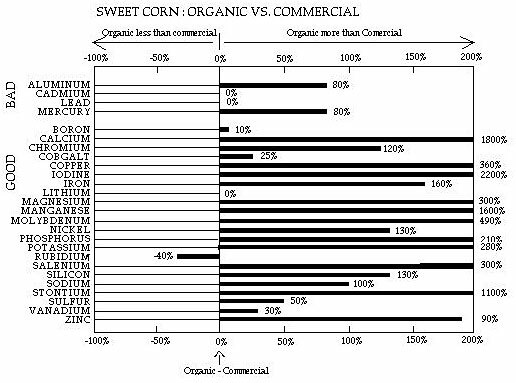 The difference in nutritional value of organic foods compared with commercial foods has been studied many times. Sharon B. Hornick's paper (l) is a well referenced discussion of this question. The difficulties in controlling soil factors such as available nutrients, texture, organic matter, and other factors of temperature, light, seed type, planting and harvesting dates as well as post harvest handling makes obtaining statistically reproducible studies difficult to impossible. These studies are intended and needed for the growers but for the consumers interested in nutrition, what is needed? They go to a store and must choose between two potatoes or two pears. One is organic, one commercial. Each is about the same size and looks like the same variety. They need a simple, practical answer. Do the foods labeled "organic" have greater nutritive concentration whether from soil factors, use of chemical fertilizers, harvesting times or from post harvest differences in handling? One factor, elemental concentration, is reported here from the consumer's point of view. Over a period of two years, foods were purchased at several stores in the western suburbs of Chicago. Apples, pears, potatoes, and corn were selected, choosing specimens of similar variety and size. Organic whole-wheat flour and wheat berries were obtained from catalogs and markets in the Chicago area. Baby foods and "Junior" foods were also included in the study. Specimens were taken to Doctor's Data Laboratories, Inc. in West Chicago, IL for analysis of elemental concentrations. The method for sample preparation for the analysis of 38 elements is an open-vessel hot-plate acid digestion. A 0.4 gram specimen of food was weighed to ± .005 gr. A 1O ml mixture of ultra-pure nitric acid and perchloric acid in 3 to 2 ratio is heated with the sample until a clear liquid is obtained. Digested samples are diluted to a standard volume and analyzed on state-of-the-art instruments. Comparable specimens were always analyzed sequentially and often rerun to determine reproducibility of certain elements. The four tables below provide the results of the testing except for that of the baby food. (In the studies of the baby food there were minor differences and these differences were inconsistent.) Graph 4 is a summary of Graphs 1-4. 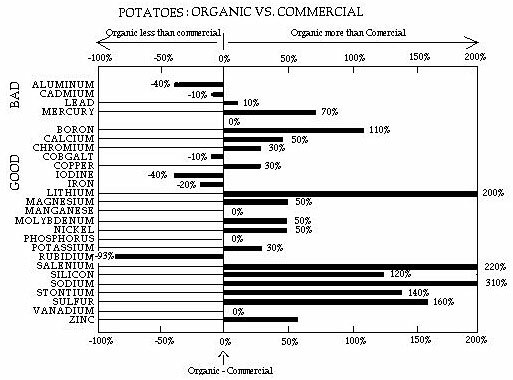 Results are expressed as a comparison of the percentage of organic foods having more or less of each element as compared with the commercial foods. This is done to eliminate the influence of the matrix effect on the results. The matrix effect (caused by different viscosity, acidity and residue in the ashed specimen) of each food type must be studied to produce accurate numerical results. In this study, the matrices were not studied, so numerical results are not reported. Why so much difference when only minor differences have been noted before? First, many prior studies compare dry weight values. Nitrogen (2), jibberelic acid and other substances can increase moisture content of a food. Second, commercial and organic farming may have changed in the past few years since many studies have been done. Thirdly, post harvest handling may make a difference not addressed in most studies. Are the levels of elements in food important? The 1988 Surgeon General's report on nutrition states that nutrition can play a role in the prevention of such diseases as coronary heart disease, stroke, cancer and diabetes. Nutritional Influences on Illness (3) cites studies that have found low levels of elements correlate with many health conditions citing many studies which show that supplementation of these elements can reduce symptoms. Examples include: alcoholism, allergy, cancer, candidiasis, cardiomyopathy, chronic fatigue syndrome, diabetes mellitus, fatigue, headache, hypertension,obesity, premenstrual syndrome, and rheumatoid arthritis to name a few. These studies do not directly prove causation but do document correlations. The elements found to reduce symptoms are the same elements found in this study at greater concentrations in organic food. The study has many limitations, but specimens taken over a two-year period provided quite similar results. 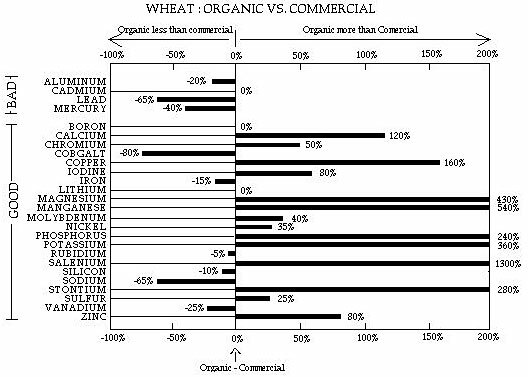 Despite the study's rotation, this suggests there are significant differences between organic and commercial food. The organic pears, apples, potatoes and wheat had, on an average, over 90% more of the nutritional elements than similar commercial food and if sweet corn levels are included, Graph 3, the average difference is over 2.5 times. Limitations include: except for wheat berries, specimens were obtained only in the western Chicago area; the number of specimens varied from 4 to 15 per food; only five foods were reported here; bioavailability of the elements in these foods was not addressed; purchases were made of foods labeled "organic", and no attempt was made to verify whether they were correctly described. 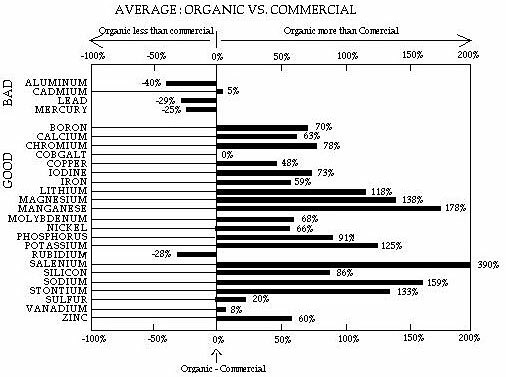 This study found for the consumer interested in elemental concentrations, a significant difference between organic and commercial foods. Further study would be suggested. 1. Hornick. Sharon B. Factors affecting the nutritional quality of crops. Am. J. Alternative Ag., Vol. 7. Nos. I & 2, 1992. 2. Kumar, Vinod, W.S. Ahlawat, and R.S. Antil. 1985. Interactions nitrogen and zinc in pearl millet: Effect of nitrogen and zinc levels on dry matter yield and concentration and uptake of nitrogen and zinc in pearl millet. Soil Science 139:351-356. 3. Werbach, Melvyn R. Nutritional Influences on Illness, 2nd Ed. 1993,Third Line Press, Tarzana, CA.